You’ve done so much in this project, and with this last step we take things to a whole new level. We’ll take full advantage of Lightning Experience features by creating a Lightning version of our Dreamhouse app. As we mentioned in an earlier step, we can upgrade our existing Classic App, which creates a copy of our Lightning App with standard navigation. But we want to create a special type of Lightning App, called a Lightning Console App. We do that from the App Manager. Lightning Console Apps lets users edit and reference multiple records at once. When a user chooses a record from a related list, it opens as a tab in the console. When a user opens a related record, it opens as a subtab. Console apps remember tabs, so that when a user navigates away from the page, they don’t lose time reopening tabs when they come back. Access to tools and utilities with the utility Items. Tabs exclusive to Lightning Experience, such as Calendar and Notes. So let’s get at it and create our Lightning Console App. Enter App Manager in Quick Find and select App Manager. There are five steps to complete the New Lightning App wizard. Image: Upload the app logo you downloaded in the first unit. The utility items gives your users quick access to common productivity tools, like Notes and Recent Items. It appears in the console as a fixed footer, where users can access open utilities in docked panels. Utilities harness the power of Lightning components. You can add a utility item to any Lightning App, including standard and console apps. You select which Lightning components you want to add to a utility item and specify their properties. You can specify how big the utility panel is and what label and icon you want to display in the utility Items. Click Add Utility Item and select Chatter Publisher and configure the properties. Click to remove the default icon. Click Add Utility Item and select Recent Items and configure the properties. Click Add Utility Item and select Notes. Now you can select the items to be included in the Console App. Items that are tied to Lightning Experience features like Notes and Calendar are only available when you’re creating or editing a Lightning App. So we’re able to add additional elements to this app that we couldn’t add earlier to our Classic App. Well done! You’ve created your first Lightning Console App. So let’s check it out. Now let’s open some records. On the Home tab, under Recent Records, click 48 Brattle St.
Click Home, and again, under Recent Records, click Edge Communications. Our Dreamhouse Console App is great, but let’s see how we can customize the experience even more. Remember the Path that we created in the last step? We add that to our property record page using Lightning App Builder. With Lightning App Builder, admins can create a record page from scratch or make a copy of an existing record page. You can give your users a customized view for each object’s records by adding, editing, or removing components to change the page’s layout, and you can customize your users’ experience even more granularly by creating custom record pages and assigning them by app, record type, and user profile. You can even control when a component appears on a record page by adding filter conditions and logic to its properties. We make changes to the property page using standard Lightning components. We then assign this customized Property Record page to the Lightning Console App we just created. From the Dreamhouse Console App, go back to the 48 Brattle St tab. Click through the Related, Details, Activity, and Chatter tabs on this page. Now let's customize this page. Click and select Edit Page. Drag the standard Path component to just below the Highlights Panel, so it spans the entire page. In the section below the Path component you just added, click the Details tab to select it. In the Tabs component properties, click Add Tab. Click your new tab, and select Custom, then enter Analytics and click Done. 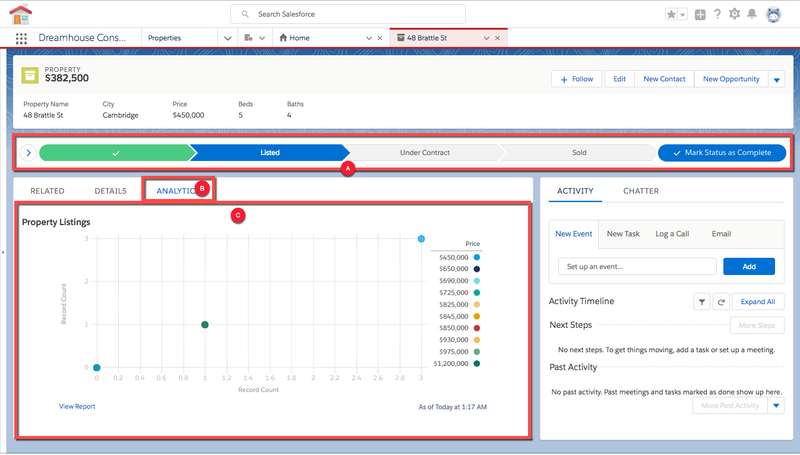 In the Tabs component display, click your new Analytics tab to select it and then drag the standard Report Chart component onto it. In the Report Chart properties, select the Property Listings report. Click App Default and then Assign as App Default. Select Dreamhouse Console to assign it to that app. Now that you have a customized your Property record page, let’s see how it looks. 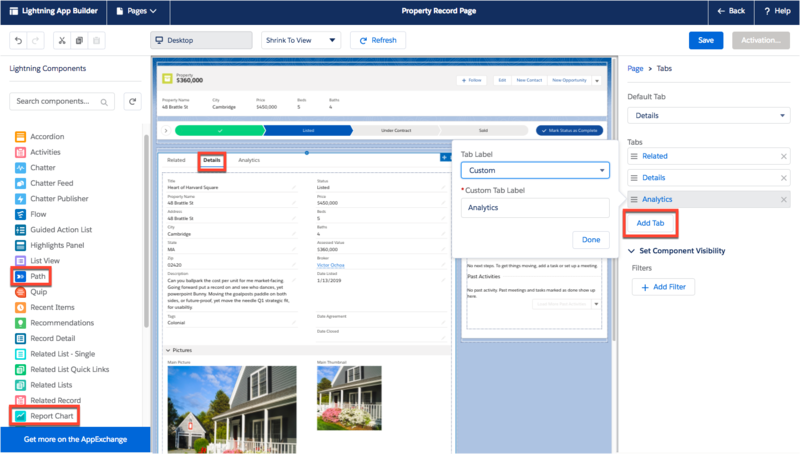 In the header, click Back to go back to the record page for 48 Brattle St. Notice the page layout is updated to include your Path component (A), and the new Analytics tab (B) with the Property Listings chart (C). Lastly, let’s test the page assignment to make sure that it only appears in the Dreamhouse Console app. In the Recent Records, click 48 Brattle St.
Notice that the Path component doesn’t display on this page, and there is also no Analytics tab. With only using clicks you went through the major phases of bringing a Classic App into Lightning Experience. You enabled an existing app and user for Lightning Experience, created a new Lightning App complete with features like utility Items and report charts, and assigned a customized record page experience to a specific Lightning App. Hopefully this gives you a taste for what’s possible in Lightning Experience. Now it’s time for you to bring Lightning Experience to your users!